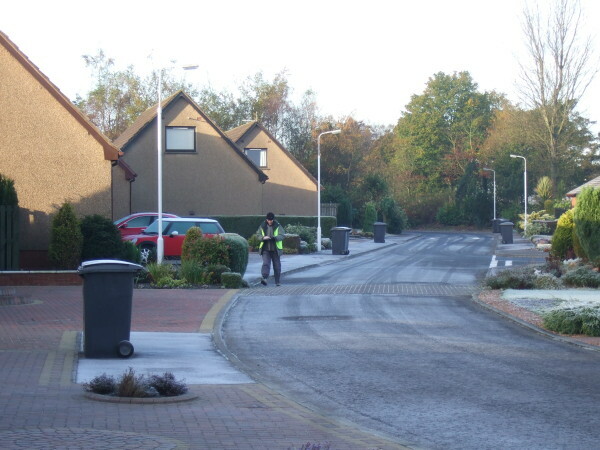 Delivering two thousand Public Whip fliers to random properties in Glenrothes took the whole of Sunday, from 8 in the morning to 10 at night. Part of the lack of efficiency was my cowardice: I skipped houses where there was a risk someone inside would see me coming up the garden path in order to injure my fingers on their metal letterbox with its internal flap and stiff brushes that do not yield to a mere folded up bit of paper. Most everyone were sunk heavy into their sofas to watch Strictly Come Dancing or the Formula One car championships on the telly, and they were not going to get out of it for some scrappy bit of paper now crumpled against their letterbox flap, let alone turn on their internet computer and copy in a URL in order to experience my boring web-page about Parliamentary politics. 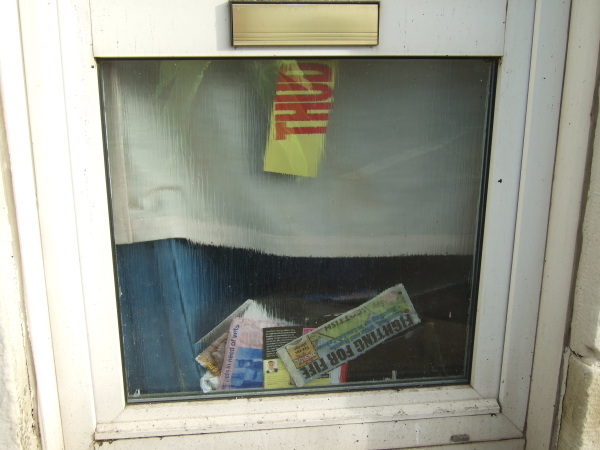 In the United Kingdom, political parties take action by delivering election leaflets. Most party politicians begin their career with a long stint of this form of activity, and they return to it in order to help motivate the troops on whose unpaid work their re-election ultimately depends. While you’d be kidding yourself if you thought that the experience in any way put you in touch with the hopes and fears of the great British public, by the time you’ve made your forty-ninth promenade across yet another unfeasibly wide expanse of brick paving bordered on one side by a 3 bay garage connected to a house whose house whose entrance configuration made it crystal clear that the whole establishment was merely a docking station for cars, rather than a place normal people would approach on foot or by bike, you begin to get the picture. Even the poorest estates were totally infested with automobiles. The excellent network of cycle-tracks throughout the metropolis were noticeably under-used. Hand delivering political leaflets through door after door for hour after hour gives a lot of time for thinking. My mind wandered. Our great leaders at all levels of government know exactly what’s coming down the line in the future. They have the numbers, they’ve seen the predictions, and they are sure of what will happen — just as they knew for a long time that cigarettes killed horribly, that industrialized force-feeding cows on ground-up diseased sheep is poisonous, that war is always an atrocity, that uncontrolled financial speculation results in a crash, that the abundant supply of alcohol to young men causes violence, and that when a loud-mouthed American billionaire property developer promises to build the world’s greatest golf course on your irreplaceable sand-dunes, he is probably lying. We would all benefit if we were governed by wise and courageous politicians who acted in accordance with real realities and actual issues. No political tribe comes close to this standard, but there are sometimes glimers of hope. The SNP want to stop twenty year old soldiers, just like those in the Black Watch, who are returning home from serving our country in Afghanistan, from buying beer in an off-licence to celebrate. Harry Wills, Liberal Democrat by-election candidate, has branded the SNP proposal as an “outrageous attack”. He said: “They SNP seem to think that our male and female soldiers, many of whom are under the age of 21 and are out in Afghanistan fighting the Taliban, risking their lives for our country, are not responsible to buy alcohol when they return. Now, Mr. Wills almost certainly knows that this is a stupid and unconstructive thing to say (as it was when it was aired earlier by Conservative MSP Murdo Fraser during the Parliamentary debate), but when you are campaigning for votes you don’t care about pulling things down and actively misleading the public about how the world works as much as you do about being elected. Just where are we supposed to get our political information from in this country? In America there are large and well-funded organizations like the League of Women Voters and vote-smart to help people assess the record and the promises made. But here you get nothing but a couple of people riding around in the dark with their home-made flier linked to an unloved website and no media back-up. There could be one lonely table reserved in the main public library, or one notice-board in the Rothes Halls where the candidates could pin up their election materials and schedule a regular hustings in the auditorium, but no, we can’t be seen giving any kind of institutional support of the democratic choices that are available here, no matter how easy and enlightening it could prove to be. We stopped for lunch in the Kingdom Shopping Centre in the middle of town. There are no shops or cafes whatsoever outside this covered area, and practically all the ones inside were chain outlets. I had the worst dish of broccoli cheese in my entire life. It was like eating a used J-cloth. If this is what Scots do to their vegetables, it’s no wonder they don’t eat any. Back outside we circled the Raytheon factory where it is alleged they make GPS-aided navigation systems (remember, those satellites were put in the sky to help the US government massacre people, not for you to find your way round while sea-kayaking) for missiles and bombs. But a job is a job, and the Raytheon website has 12 currently open for highly skilled employees that will probably be paid enough to buy all those SUVs and run them on the oil our brave soldiers have been fighting over for the last six years. I knew I’d find a business like this, because the Labour candidate had sneered on his website about the SNP’s plans to cut military spending over-all. This kind of argument really pisses me off, because it concedes that military spending has nothing to do with the protection of liberty and justice, but doesn’t go so far as to make the connection that — but for the wholesale penetration of the body politic by the military-industrial complex — the government could be spending the national wealth on equipment that was actually productive, such as insulating all the houses so they consumed less fuel, or building electrified railways between towns in anticipation of the time when it became no longer viable to burn oil. THUD! That’s the unwelcome sound of another whopping great energy bill landing on your doorstep. Use your vote to demand cheaper energy. No mention how this would be a fundamentally temporary and costly measure that answers nothing to the question of how we’re going to deal with the next five or twenty-five years. Politics these days is advancing one day at a time, like a man walking backwards with his gaze only on the past. It’s frightening. Meanwhile, the Prime Minister Gordon Brown was in Saudi Arabia, following his second visit to the Glenrothes, where the BBC reported his efforts to persuade the sheiks to invest their easy-earned cash in renewable energy in the UK. In my lifetime British Prime Ministers have only ever tried to do two things in Saudi Arabia: (1) persuade them to buy billions of pounds of weapons equipment from BAe who are above the law when it comes to bribery and corruption, and (2) persuade them to pump more oil to bring the price down so we can burn more of it and not change our lifestyle for another few moments. If there’s one thing about the rich, especially the super-rich, it’s that the concept of the public good simply doesn’t exist. We’re just dots on the ground far below. They don’t care about us at all. There are rules about how vast sums of private capital can only ever be shifted around on the basis of the most greedy and selfish terms possible. The deals are only done when they see they will make more money in the end. That’s never the question. The question is why do politicians keep insisting that they have to deal in this way that always guarantees them a profit on their “investment” and puts us deeper in debt, when it’s quite obvious that there has always been enough of our own public money available on far better terms. That was until this great bank bail-out to cover their profits. We were staying in the Glenrothes Travelodge, which appeared to be run single-handedly by one employee at a time providing 24 hour coverage in 8 hour shifts. They were excellent, friendly (if a bit overworked), and let us stash our bikes safely inside down an unused hallway. Across the road was a gigantic Amazon.com “fulfillment” centre. The weather was absolutely gorgeous too. We finished delivery of the last few leaflets on our way out of town before the long hilly cycle-ride back to Edinburgh, only partly thrown off course by the propensity of some of the locals to removal crucial signposts marking part of the way. My brain finally stopped spinning with random thoughts about politics. From my observation, there was very little political activity going on in the constituency. We visited every corner of the network of towns, including a trip out to the Henge in Balfarg and maybe saw six party posters in the windows of the houses. The UKIP contingent passed us by in their cars bearing those stupid car window flags everyone had during the football world cup. We saw two activists on the street knocking on doors. There were three SNPers handing out balloons and flags (no leaflets) by the shopping mall on Saturday. And that’s it. It was nothing like what I saw in Crewe during the by-election there. Pretty much all the activity as reported in the news, from what I can see, is in the form of sham photo opportunities that don’t represent the reality. I will be interested in seeing the results, which will be overshadowed in the news by the US Presidential election. No doubt the timing is coincidental. On the train home I listened to Ground War for the Presidency on This American Life, where they covered the experience of the party-workers in Pennsylvania State. It made me cry. I urge you to listen to it. What these people go through in terms of democratic involvement, well, nothing in this nation comes within a thousand miles of it. We have nothing to be proud of. Truthfully. I’ve also poked a lot of flyers through letterboxes and know exactly how it feels with your fingers semi trapped by the inner flap.